Mexican drug cartels, Hezbollah (Party of God) and other Islamic terrorist groups are joining forces in Mexico. Hezbollah is synonymous with terror, suicide bombings, kidnappings and beheadings. No wonder the criminal organizations in Mexico seem to have adopted many Middle Eastern terrorist tactics with kidnappings and beheadings happening throughout Mexico. According to authorities global Islamic terrorist have moved into Mexico and other Latin American countries to open the door for Mexican cartels to have excess to Afghanistan cocaine at bargain basement prices, those profits from those sales are being passed on to Hezbollah and other terrorist organizations worldwide to attack the states from within. Hezbollah is known to be raising money for their cause in the U.S and some Americans say they have brought suite case dirty booms into the U.S. and are waiting for further instructions. Hezbollah is currently training Mexican drug cartel enforcement gang members. They are teaching them their gorilla terror tactic’s that they use in the Middle East. One high ranking Mexican Army officer who will at his request remain anonymous says Hezbollah is now believed to be training Mexican drug cartel enforcers the art of bomb making. It is now feared that there will soon be car and truck bombings of Mexican solders at the many road blocks that they have set up throughout Mexico, their barracks, police stations and even government buildings are at risk. The training is designed to combat the Mexican Army and police, American Special Forces and DEA agents now operating in Mexico. According to Mexican officials Hezbollah is training the opposition to the Mexican Army and is starting to be seen throughout the country. There are new reports of late, of hit and run tactics against Mexican military set up road blocks where both attackers and Mexican solders have been killed. Before September 11, 2001, Hezbollah was responsible for more American deaths than any other terrorist organization. 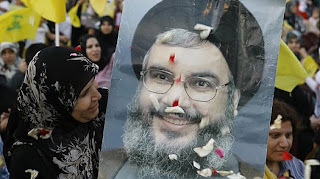 Hassan Nasrallah, the group's secretary-general, recently proclaimed, "Death to America was, is, and will stay our slogan." In spite of all that, the terror and violence in Mexico, Mexican officials are encouraging Americans to visit Mexico in a new tourist campaign. But with more than 1,200 people having been killed this year alone in Ciudad Juárez that is not happening. Juarez has a population of 1.5 million people many depending on American tourist dollars. But many El Pasons who live in El Paso a bordering city of about 350,000 say they are just to frighten to risk going into Mexico. Mexico’s violence of terror along with the world banking and financial crises that are happening today are forcing drastic changes in the rate of tourism to Mexico, especially border regions from the Gulf of Mexico to the Pacific Ocean. Mexico has been heavily dependent on tourism and American investors and both are drying up. Oil and drugs are now Mexico’s official and respectively unofficial main stay for what economy they have. From Brownsville Texas to San Diego California the drug-related dangers and violence is so staggering that the country has been declared off-limits to all U.S. Military. Residents on the American side of the border have told the Laguna Journal that they are afraid to cross over to visit family, shop or conduct business anywhere along the border. Violent spillover from crime-ridden Mexican border cities are a growing concern for Americans. With cartel-related killings in Chihuahua alone now topping over 1200 for the year, officials in the states are increasingly concerned about “spillover” of crime from neighboring border cites. In El Paso, real effects are being felt at the city’s hospital, where officials report dozens of cases of individuals wounded over the border in the Mexican state of Chihuahua being treated at their facility. Just last week the State of Morelos Deputy A.G. for Organized Crime Affairs and two escorts were killed by what appeared to be a well organized paramilitary unit in a car-to-car gunfire assault. The killers then fled in two military style vehicles. Another significant issue is that now Mexico's toll of deaths linked to organized crime has reached four thousand so far this year, a historic record. That is more violent related deaths than Iraq and Afghanistan combined. Mexico is reported to be on track to near 5,000 before the end of 2008, another record. The last one thousand deaths have taken place in 48 days. The first one thousand deaths of the year took place in 114 days, the next one thousand in 72. But seventy days later, it reached 3 thousand. 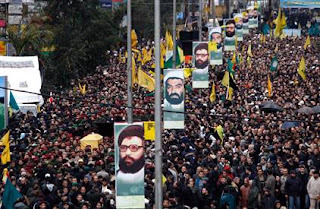 Iran, Hezbollah's longtime sponsor, and donations from the Lebanese Diaspora are two sources for a multimillion-dollar budget that pays for the militia's armed and political wings and for social projects such as money, food and hospitals in Beirut. But investigations around the world have shown that Hezbollah also funds itself through drug dealing, arms trafficking, contraband smuggling and other rackets in the Americas, Africa Europe and elsewhere. The L.A. Times is reporting U.S. and Colombian investigators have dismantled an international cocaine smuggling and money laundering ring in Bogota, Colombia and Madrid Spain, that allegedly used part of its profits to finance Hezbollah, the Lebanon-based Shiite militia, officials said. Just recently, ten gunmen lost their lives after a shootout with state agents in Nogales, Sonora. The police were attacked with fragmentation grenades; three police and three civilians were wounded. The body of a gagged man was found in Cabo San Lucas a known and popular American tourist spot. His fingers had been chopped off. Eight persons have died in Baja California Norte in the last 24 hours, the product of a spiral of violence. (Note: the Baja California Peninsula is divided into two states with the same name; each is differentiated by “Norte” and “Sur”) In the morning the bodies of two men were found, both shot to death out of different events. Just recently two Rosarito police officers were assassinated while on patrol. Twenty kilometers away three other persons were murdered. This is an area where Americans murdered bodies have been found. A related account in “El Universal” (Mexico City) states that violence in Rosarito has cost the lives of seven police and at least a dozen other persons in less than thirty days; it adds that there have been mass resignations of police there because of fear of being murdered. (Note: just some years back Rosarito Beach was a laid back American tourist attraction, peaceful ocean beach town not far from Tijuana and San Diego. According to Mexico City daily newspaper Reforma’s running tally of cartel-related killings, or Ejecuciones, (executions/assassinations) Chihuahua’s weekly rate of killings remained higher than it was before over two thousand soldiers and federal police were deployed there in mid-March. Seven other crimes took place in Chihuahua; two men were found dead in Hermosillo, Sonora, two in Culiacan and some others in Guanajuato, Guerrero, the Distrito Federal and Taxco. From Aug. 9 to Aug. 15, Chihuahua had an unprecedented 79 ejecuciones, including the gangland-style killing of 13 partygoers in the town of Creel in the Sierra Tarahumara Mountains, a key transit point for drugs en route to the U.S.-Mexico border. Among the dead were several teenagers, a university professor, and a 1-year-old baby. Research group Consulta Mitofsky’s annual survey Encuesta Nacional en Viviendas revealed strong public will for drastically strengthening enforcement measures to combat organized crime in the country. Police say six people were lined up and gunned down outside a business in this violent border city Juarez. City police spokesman Alejandro Pariente says a written statement "for all rats" was found among the bodies and declared that the killings "will continue." Pariente says investigators found more than 100 bullet shells at the scene. He says no arrests have been made. Again in Tijuana this past week, at least five people are dead following a clash between soldiers and gunmen protecting a safe house near a junior high school in a residential area of the city. Concern about recent violence led a medical group to urge a voluntary curfew Wednesday through the end of November, calling for residents to avoid going out after 9 p.m. This is real terror and it’s happening right in our own front yard and is expected to escalate and U.S. law enforcement fear it’s just a matter of time and we’ll be dealing with it right here at home. There already have been reported suspected attacks by these Mexican terrorist in Phoenix Arizona, Las Vegas Nevada, Atlanta Georgia, Dallas Texas and Birmingham Alabama. U.S. drug czar John Walters said Friday that Mexico's drug cartels are crossing the border to kidnap and kill inside the United States. Walters, director of the White House Office of National Drug Control Policy, was in Mexico for two days to discuss efforts with local officials to stem killings, weapons trafficking and money laundering by Mexican cartels and their U.S. associates. "Some of these groups not only engage in crime and violence not only in Mexico and along the border, but they come across and kidnap, murder and carry out assassinations," Walters told reporters. "These groups do not respect the border." Walters praised Mexican President Felipe Calderón for mounting a police and army offensive against the cartels, which he called "terrorist criminals." Justice in Mexico Project of the Trans-Border Institute at the University of San Diego.